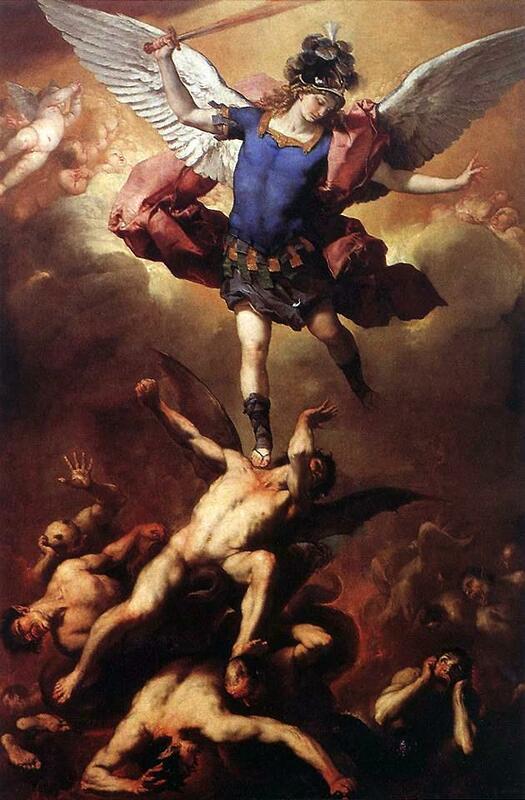 The glorious Archangel appears today at the head of the heavenly army: There was a great battle in heaven, Michael and his angels fought with the dragon, and the dragon fought and his angels. In the sixth century, the dedication of the churches of St. Michael on Monte Gargano and in the Roman Circus increased the celebrity of this day, which had however been long before consecrated by Rome to the memory of all the heavenly Virtues. The east commemorates on the sixth of September an apparition of the victorious Prince at Chone (ancient Collossæ) in Phrygia; while the eighth of November is the solemnity of the angels, corresponding to our feast of today, and bearing the title: “Synaxis of Saint Michael prince of the heavenly host, and of the other spiritual Powers.” Although the term synaxis is usually applied only to religious assemblies here on earth, we are informed that in this instance it also signifies the gathering of the faithful angels at the cry of their chief, and their union eternally sealed by their victory. Who, then, are these heavenly Powers, whose mysterious combat heads the first page of history? Their existence is attested by the traditions of all nations as well as by the authority of holy Scripture. If we consult the Church, she teaches us that in the beginning God created simultaneously two natures, the spiritual and the corporal, and afterwards man who is composed of both. The scale of nature descends by gradation from beings made to the likeness of God, to the very confines of nothingness; and by the same degrees the creature mounts upwards to his Creator. God is infinite being, infinite intelligence, infinite love. The creature is forever finite: but man, endowed with a reasoning intellect, and the angel, with an intuitive grasp of truth, are ever, by a continual process of purification, widening the bounds of their imperfect nature, in order to reach, by increase of light, the perfection of greater love. God alone is simple with that unchangeable productive simplicity, which is absolute perfection excluding the possibility of progress; He is pure Act, in whom substance, power, and operation are one thing. The angel, though entirely independent of matter, is yet subject to the natural weakness necessary to a created being; he is not absolutely simple, for in him action is distinct from power, and power of essence. How much greater is the weakness of man’s composite nature, unable to carry on the operations of the intellect without the aid of the senses! O Christ, my Christ, as St. Denis calls Thee, the Church today delightedly proclaims Thee the beauty of the holy angels. Then, the God-Man, art the lofty height whence purity, light, and love flow down upon the triple hierarchy of the nine choirs. Thou art the supreme Hierarch, the center of worlds, controller of the deifying mysteries at the eternal feast. Flaming Seraphim, glittering Cherubim, steadfast Thrones, court of honor to the Most High, and possessed of the noblest inheritance: according to the Areopagite, ye receive your justice, your splendor, and your burning love by direct communication from our Lord: and through you, all grace overflows from Him upon the holy city. Dominations, Virtues, and Powers; sovereign disposers, prime movers, and rulers of the universe: in whose name do ye govern the world? Doubtless in His whose inheritance it is; in the name of the King of glory, the Man-God, the Lord strong and mighty, the Lord of hosts. Angels, Archangels, and Principalities; heaven’s messengers, ambassadors, and overseers here below: are ye not also, as the apostle says, ministers of the salvation wrought on earth by Jesus, the heavenly High Priest? We also, through this same Jesus, O most holy Trinity, glorify Thee, together with the three princely hierarchies, which surround Thy Majesty with their nine immaterial rings as with a man-circled rampart. To tend to Thee, and to draw all things to Thee, is their common law. Purification, illumination, union: by these three ways in succession, or simultaneously, are these noble beings attracted to God, and by the same they attract those who strive to emulate them. Sublime spirits, it is with your gaze ever fixed on high that ye influence those below and around you. Draw plentifully, both for yourselves and for us, from the central fires of the Divinity; purify us from more than the involuntary infirmities of nature; enlighten us; kindle us with your heavenly flames. For the same reason that satan hates us, ye love us: protect the race of the Word made Flesh against the common enemy. So guard us, that we may hereafter be worthy to occupy among you the places left vacant by the victims of pride. Adam of St. Victor thus sings the fullness of today’s mystery. Let love break forth into praise; let our choir sing in presence of the heavenly citizens: our praise will be pleasing and beautiful, if the purity of our hearts be in accord therewith. Let all praise Michael; let none deprive himself of this day’s joy. O happy day! whereon the solemn victory of the holy angels is recorded. The old dragon is cast out, and all his hostile legions put to flight: the disturber is himself disturbed, the accuser is hurled down from the height of heaven. Under Michael’s protection there is peace on earth, peace in heaven, praise and exsultation; for he, mighty and valorous, stands for the safety of all and triumphs in the battle. Banished from heaven, the originator of sin wanders through the air: he watches to lay his snares, and insinuates his poison; but the guardian band of angels reduces his power to nought. The three distinct hierarchies are ever occupied in contemplation and unending song; nor does their contemplation nor their ceaseless harmony interrupt their continual ministry. Oh! in the heavenly city how wondrous is the charity of the three tripled choirs; they love us and defend us, and hope to see their ranks filled up by thee. As among men there are divers graces upon earth, so in the heavenly reward the just will receive divers degrees of glory; other is the excellence of the sun, other that of the moon, and various the brightness of the stars; so shall be the resurrection. Let the old man be brought into conformity with the new, the earthly to the purity of the heavenly citizens; he is one day to be equal to them, and though not yet wholly pure, let him in hope look forward to the prize. That we may be assisted by these blessed spirits, let us devoutly venerate them and be untiring in our homage; sincere devotion reconciles to God and unites us with the angels. Thus may the most high senate recognize us as coheirs: and may the divine grace be praised alike by angels and men. To our divine Head be glory and among his members union. Amen.